1. When planting succulents, make sure you use a soil that is designed specifically for succulents. This soil is lighter than regular potting soil and allows water to drain much faster. Succulents don’t like to have “wet feet”. 2. It is important to pick a container that has proper drainage. These containers have holes in the bottom. Shallow containers are often chosen because succulents have shallow growing lateral roots. 3. When the soil has completely dried out, it is time to water. The frequency of watering is dependent on a number of factors such as the amount of sunlight, your house temperature and the time of year. 4. Succulents love the sun. Make sure you leave your succulents in a place that gets 4-6 hours of bright morning sun, and not in the scorching hot summer sun. Succulents prefer dappled light vs. direct sunlight. 5. Designing a succulent arrangement is a lot of fun. 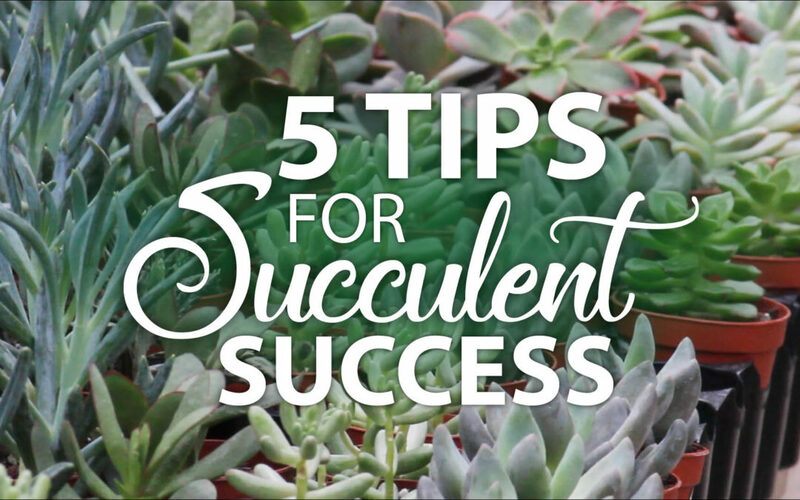 First, pick a larger centerpiece and work your way around it with smaller succulents. An odd number is more visually appealing than an even number. You can finish your arrangement by adding pebbles or small rocks to the top. Start your succulent journey today. It’s easy, care-free, and you will love how these plants bring colour to your home and joy to your day! 10 Easy Steps for Growing Your Own Seeds!